Keep your office and workspace neat and organized with the Portable File Box. This is an ideal solution for both storing and moving letter-size hanging file folders, whether you need to take your files into the next room or across town. Label folders to create a custom organization system to keep those important files sorted and easy to find, while reducing clutter around the home or office. 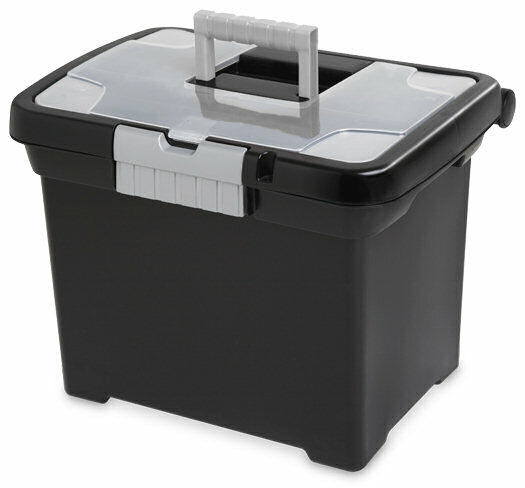 The in-lid storage compartment is great for keeping small items, such as paper clips, post-its, pencils, calculator or even a 12” ruler, handy and easy to access. The durable latch ensures that the lid stays shut and the sturdy handle allows for comfortable carrying. The File Box accommodates a small padlock for added security. The overall dimensions for this item are 15" x 10 7/8" x 11 1/2". 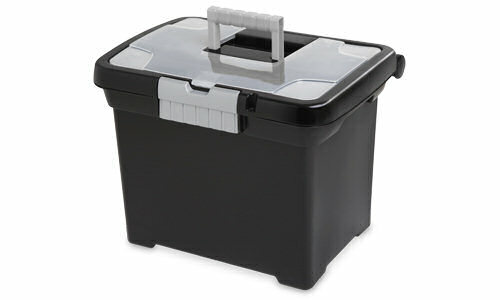 Overall Assembled Size: 15" x 10 7/8" x 11 1/2"
Ideal for storing or transporting file documents in an office or on the road. Portable File Box is rated 4.5 out of 5 by 40. Rated 5 out of 5 by Tiredmommy2011 from Awesome little file box Heavy duty, love that it has a little compartment on the top to put little things like pens or paper clips. The latch is sturdy. I really like this file box! Rated 5 out of 5 by Jerry5 from Great little box. I have 5 of these file boxes right now and i really like the utility they provide. Rated 4 out of 5 by Lisakra13 from Perfect file box but not the latches. I love this file box it's very sturdy and plenty of room for filing. Downfall is the latches. I have two and both latches are broken. Rated 4 out of 5 by albert from Great box to store papers in folders I found this file box to be good. The latch is still working ok but some care needs to be taken when using this file box as everything is made from plastic fittings. The one item that needs to be address is the lid when open all the way keep closing as a couple of plastic tab for the clear plastic storage area above hit on the back of the storage box not allowing the lid to stay open. Everytime thumbing through file folder the lid would keep falling closed. I took a knife and cut some of the plastic on the rear of the box under the clear plasic tabs that hold the storage area above. Now the lid stays open, however I think Sterilite should have design mods that allows the the lid to stay open without the modification using a knife. Perhaps allow the lid to even fall back a bit farther when all the way open would help with it's functionality. I seem to remember that latch may have fallen off a couple of times however with a little care the latch hasn't been a problem. Rated 3 out of 5 by mac48 from Broken latch I have 4 of theses file boxes and they do the job. But had problem with latches on two boxes broke with in a year after purchasing. Can't lift portable box by handle any longer. I open then quite frequently and they didn't take the open and closing well. They a very thin in the pivot area. Hope to get a response from Manufacture on my issue. Rated 3 out of 5 by Papacliff from Nice product,except for the latch We've had this box a few months, with fairly light use. By the third time we opened it, the attachment points for the latch broke. I'd ask for a new latch, but the part that broke is on the box itself. We still use the box, we just can't pick it up from the top handle anymore. It is disappointing, but not fatal. Rated 5 out of 5 by svwhy1461 from Great extra storage I was able to store the files with coloring sheets and construction paper for the kids out of the way without them getting bent and torn. There was also space left for storing the leftover school supplies (notebooks, folders and pencils). Rated 5 out of 5 by kitty from What a Great File Box! This file box is wonderful. It is especially useful, since it can be carried anywhere. The top has space for office supplies, pens, scissors, clips etc., and it smaps shut. 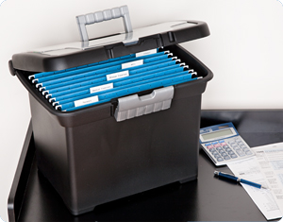 The rest of the file box fits letter size files and is great for anyone who needs to take their office records with them. Also great for the home because it is just the right size to fit into a small home office area. Sterilite comes up with the greatest products! Couldn't live without them.